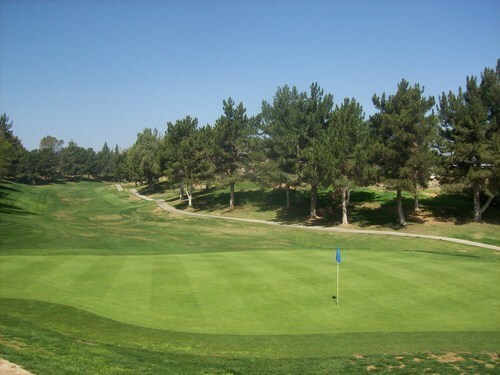 I wasn’t sure if I was going to play at all Saturday, but a friend invited me out to play Jurupa Hills (and cover half of my greens fee), so it was an offer I couldn’t resist. 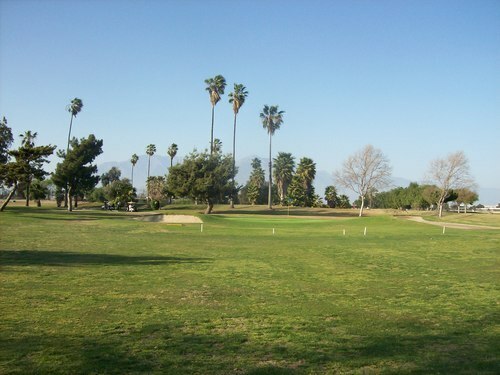 Even though I’ve played Jurupa a number of times in the past, I’ve never reviewed it on my blog and I’ve never photographed the course. 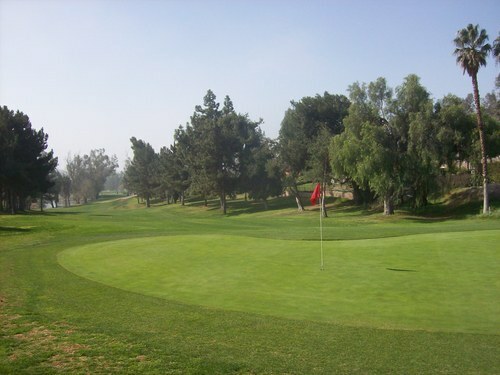 It was a good choice because I always have a soft spot in my heart for this fun little course with an old school vibe. 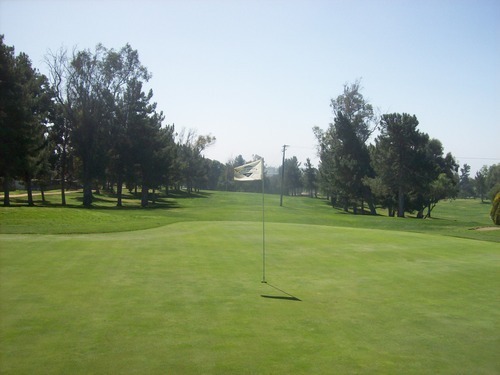 Jurupa Hills is not a long course, but it provides an ample amount of challenge with pretty tight fairways, some hilly terrain, tough doglegs and large, tricky greens. 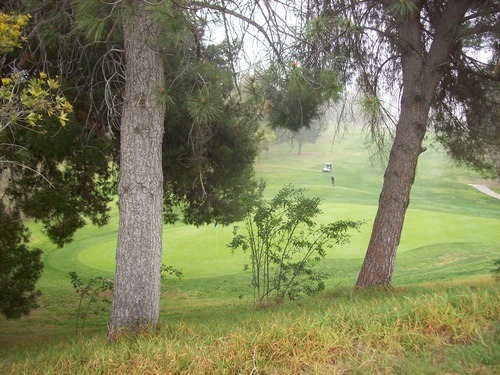 There are also plenty of big trees here and they get in your way a lot from tee to green. 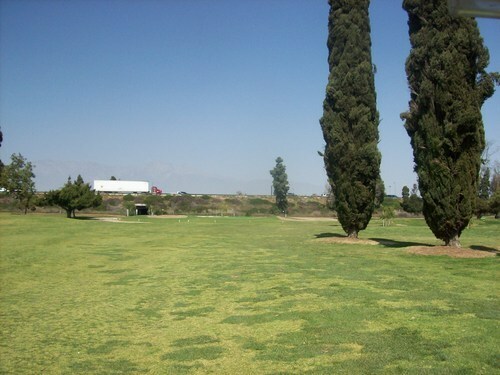 The facilities are pretty old and the place always seems full of “regulars” who are out there for their weekly rounds. 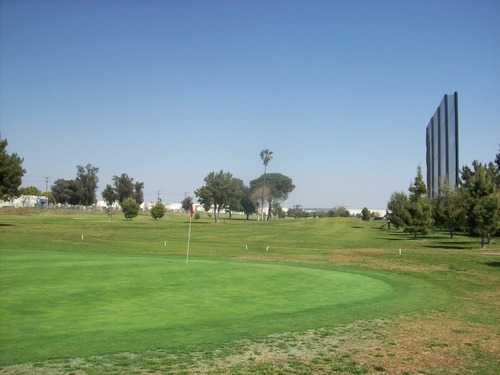 Though it’s not the cheapest course around, it’s usually a decent value for what you get. We paid $46 yesterday. That’s near the top end of what I’d prefer to pay here, but worth it for a primetime (8:00 am) tee time on a Saturday. I was impressed with the one guy working the counter in the pro shop, who was also calling out groups to the first tee. It was extremely foggy yesterday morning, but he kept the place running smoothly and on time. I think he did a better job by himself than most other courses do with a whole staff of dudes in the pro shop and designated starters. They keep it simple here and it works. My buddy and I were paired with another twosome. 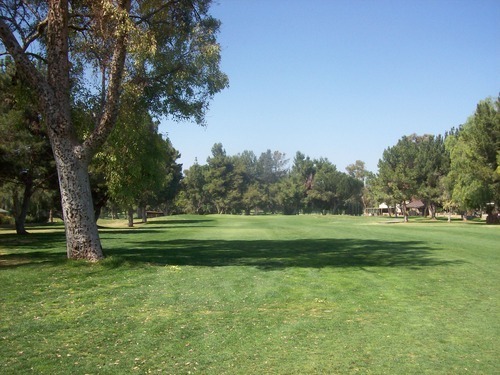 We teed off right on time and enjoyed a nice pace of around 4:20—not bad at all for a busy Saturday on the course. 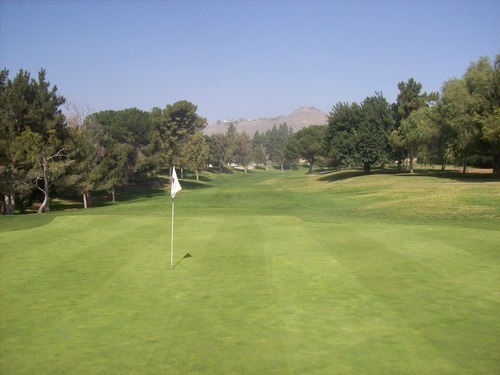 Jurupa Hills has a fun design that keeps you guessing on each hole. There are a few blind shots and some big doglegs where positioning off the tee is key. 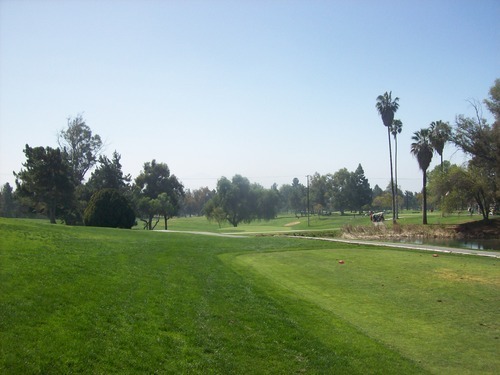 To me, the 11th hole always stands out as one of the toughest in all of Southern California for my particular game, because I am not a long hitter and I play a big fade shot. 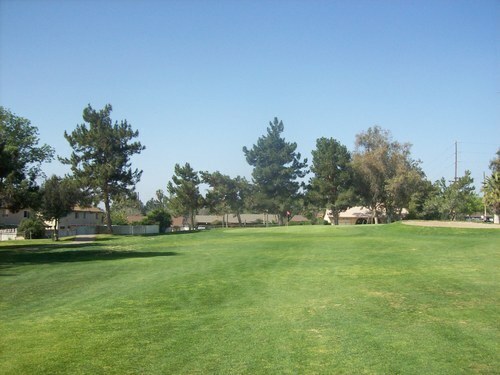 From the blue tees, it plays 446 yards. 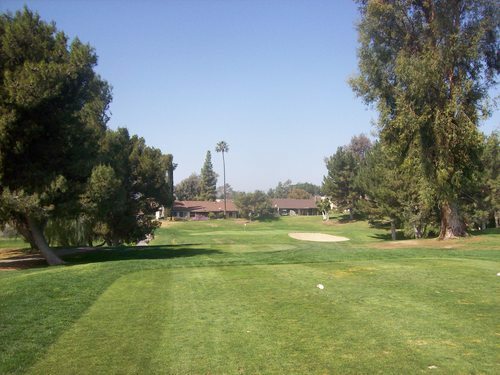 The tee shot is tight and then the hole takes a wide turn around the corner to the left and back uphill toward a green that’s hard to get at. 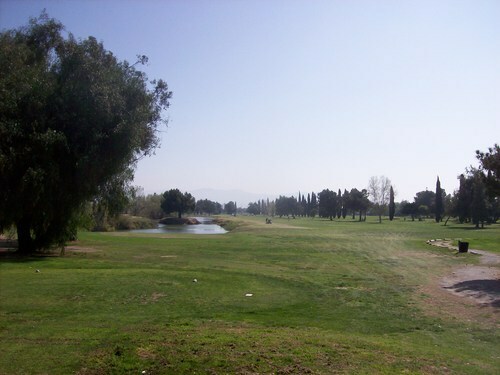 For me, it’s always a three-shot hole. For big draw hitters, it may not be as intimidating. 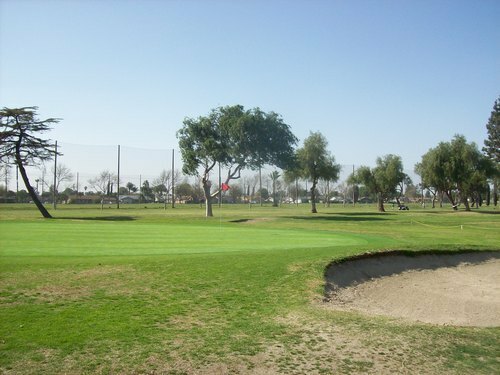 What I am not too fond of at Jurupa are the telephone poles and low wires that cut across a few holes on the course. There are telephone poles right in the middle of the 9th and 17th fairways, which both happened to be right in my line of sight yesterday on approaches. 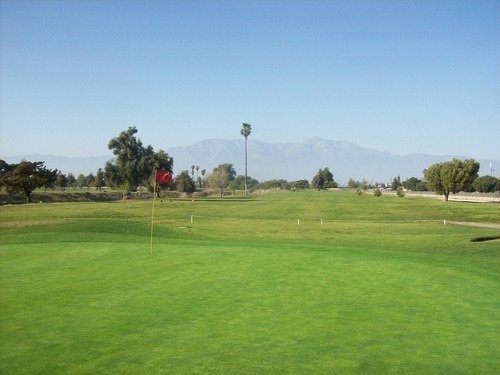 In my opinion, Jurupa is just a notch above lower level or muni courses in terms of conditioning. It’s not superb there, but it’s generally pretty good. The greens were great on this visit. They were just about perfect, though they were unfortunately getting ready to punch the following weekend. The greens are always the highlight here in terms of design and conditioning. 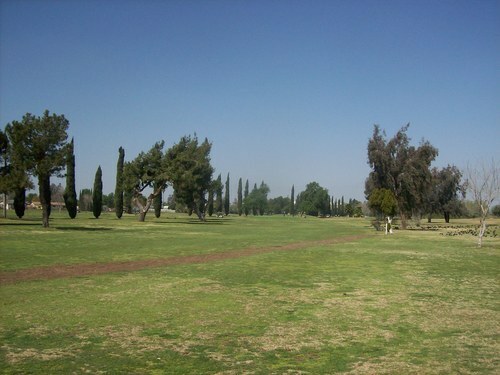 The fairways were mostly green and pretty good overall, but rather shaggy in places and patchy here and there. Sometimes you’d have a nice fluffy lie sitting up and other times it would sink down a bit in a poor area. The rough was pretty nice throughout and quite thick in some areas. I wasn’t in a bunker, so I can’t comment on those. The tee boxes were pretty good, as well. 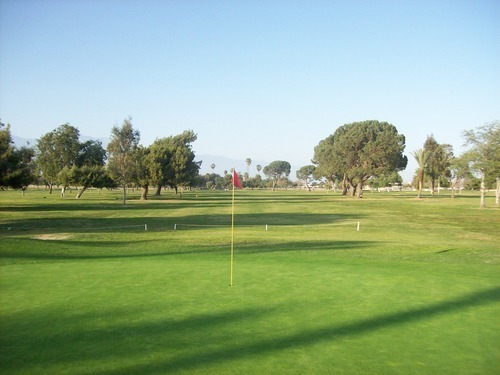 Though it’s not a course you’d go way out of your way to play, Jurupa Hills is always a solid option and deals can be found throughout the week. 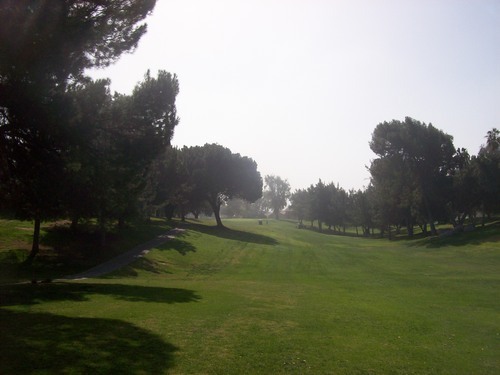 I would definitely choose it over Indian Hills or Paradise Knolls, if I’m comparing it directly with nearby courses in a similar price range. It’s nothing flashy, but always enjoy my rounds here. 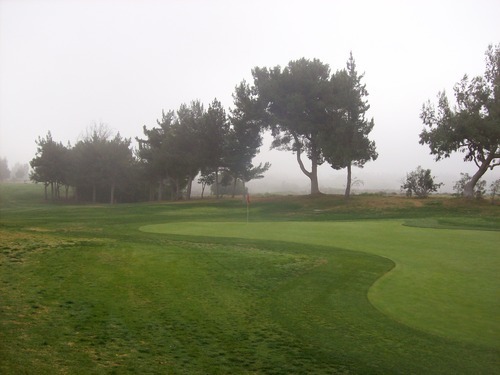 The fog had finally lifted by the time we made the turn and it was gorgeous weather for us on the back nine. This was actually an easy choice for a number of reasons. 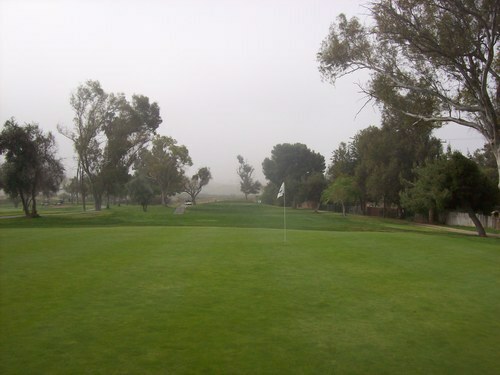 One, in relation to Jurupa Hills, it was the most geographically close course I hadn’t played yet. Two, it’s pretty cheap. It cost me $32 with a cart, though it is a great course to walk if you want to stay really cheap with their $23 walking rate. I’ve always heard nightmares about slow play at Whispering Lakes. Plus, you can see it from the 60 Freeway and I knew from what I’ve seen that it wasn’t anything too special. Nonetheless, I figured I would drive by and see what it was looking like. If I could get out quickly and finish before dark, it would be worth the visit. The good news is that when I pulled into the parking lot, it really didn’t look too busy out there. The first tee was wide open and the course didn’t look super crowded. I checked in with the pro shop and they said I could head out whenever I was ready. Excellent. The bad news is that by the second hole I had already caught up to the groups ahead. I found another single on the second tee and we joined up. There was a fivesome in front of us and clearly groups in front of them moving just as slowly. It was brutal as a twosome behind a fivesome, but it got even worse when the other guy decided to give up after 7 holes. That left me as a single behind the fivesome for the final two holes (both par-5s, of course) of the front nine. Luckily, at the turn I was able to jump ahead of them and join another twosome that was still on the 10th tee. The pace was still agonizingly slow after that and we waited a lot between every shot, but it was infinitely more tolerable playing with a group than by myself. The funny thing is that the round felt like it took forever, but end the end it was only about four hours and 45 minutes from the time I teed off to the time I finished. Not a great pace by any stretch, but not bad for a busy Saturday on this course. Otherwise, Whispering Lakes was exactly what I expected. This is one of the most boring layouts I’ve ever played. It’s very flat, it’s very wide open and there isn’t too much trouble to get into on the entire course. 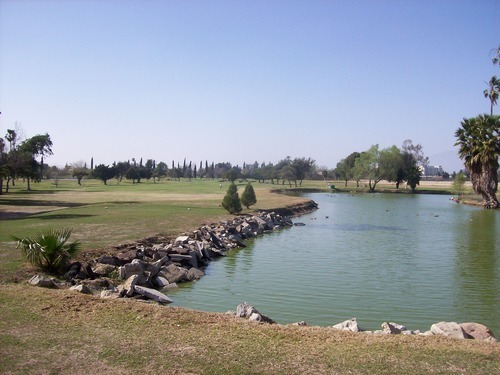 There are a few decent holes here and there and some water comes into play on some of the better holes, but there are a lot more boring holes than interesting ones. Out here, you can pretty much swing as hard as you want with a driver on the tee and not worry too much about where you end up. It’s kind of fun in that respect, but it’s not terribly exciting overall. 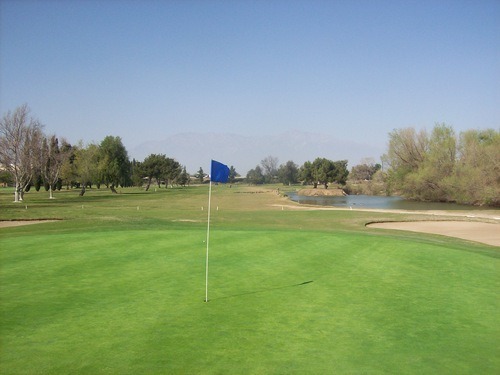 From the blue tees, Whispering Lakes is fairly long at over 6,600 yards and the greens are quite small. These elements add some challenge to it, but the dry conditions yesterday provided plenty of extra roll-out and helped negate the length. The biggest difference between the blues and whites is found on the par-5 9th. From the whites, it’s only 466 yards. From the blues, it’s 577. 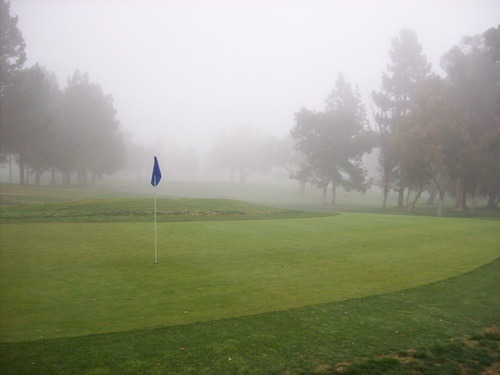 The course was in “average” muni shape for this time of year. 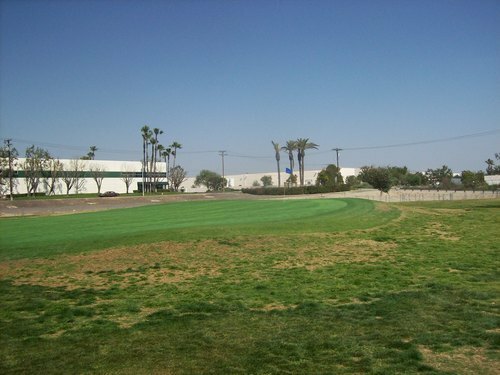 The fairways and rough were basically the same (no real distinction). They were patchy throughout—very thin in some areas and some nice patches of green/lush grass in others. The tee boxes were a completely mixed bag. Some were horrible bare sand/dirt and others were super nice, and then there was everything in between. The one bunker I was in was decent—not great sand but better than I expected. 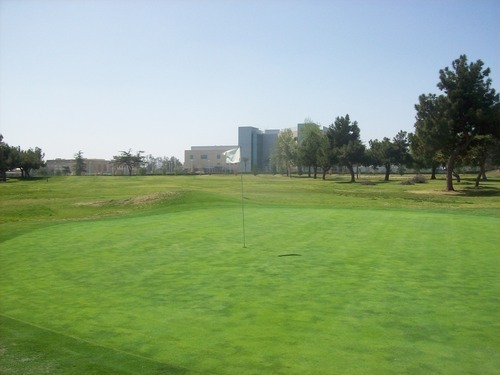 The greens were actually pretty nice. They were a bit “artificially” green, having been sprayed with some kind of fertilizer/pesticide or something to give them a little fake green sheen. 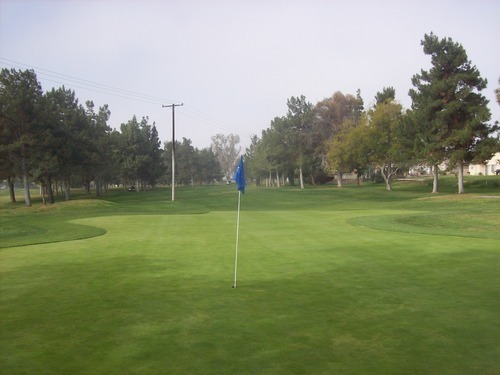 They were very soft and spongy, which gave them a lot of nice bite on approaches and chips, but they were pretty doggone slow on putts. Though I doubt I’ll ever play here again, Whispering Lakes does serve a purpose. 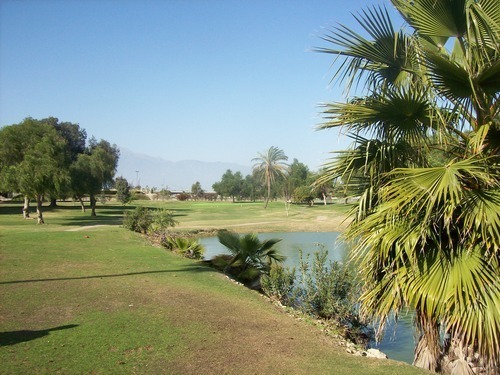 It is a cheap course that’s pretty easy to get on when everything else is booked. They don’t pretend to be anything special, but you can expect a slow round like on most SoCal munis. 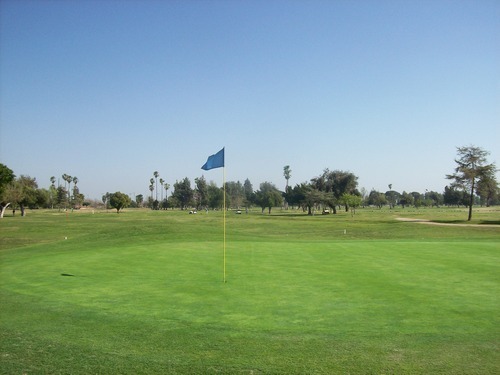 It is a good course for beginners because there’s plenty of room for error, but the length from the blue tees is still enough to make good players work a little bit. The layout is pretty boring and the scenery is pretty awful in an industrial part of Ontario right next to a loud/busy freeway.